Will compete in Nurburgring 24 hours in June. 20 per cent weight reduction of hybrid components (-50 kg). Same lap times, reduced fuel consumption. Electric front drive with more power; integrated seamlessly into driving controls, with standalone "push to pass" feature. If you're viewing this post via email it may be easier to visit our site to see the Pictures of the 911 GT3 R Hybrid. The interface works better that way. Porsche takes up the Nürburgring 24 hour race on 25 June with a further developed version of the Porsche 911 GT3 R Hybrid. Priority of the development was given to the improvement of efficiency through the targeted optimisation of hybrid components, which also resulted in a 20 percent weight reduction. Version 2.0 of the 911 GT3 R Hybrid is intended to achieve the same lap times as its predecessor but with less fuel consumption. The general layout of the hybrid was adopted from the 2010 model. A portal axle with two electric motors drives the front wheels and supplements the four-litre, depending on the balance of performance classification approximately 470 hp, six-cylinder boxer engine at the rear. The output of both electric motors has increased from 60 to 75 kilowatts each. For seconds at a time, pilots now have almost an additional 200 hp at their disposal with the 911 GT3 R Hybrid 2.0. Depending on the programming, this power is automatically activated through use of the throttle pedal. Moreover, pilots can manually call up this extra power, for instance when overtaking. The electric flywheel accumulator, with its rotor spinning up to 40,000 rpm and storing energy mechanically as rotational energy, is now housed with the other hybrid components in a carbon fibre safety cell on the passenger’s side. 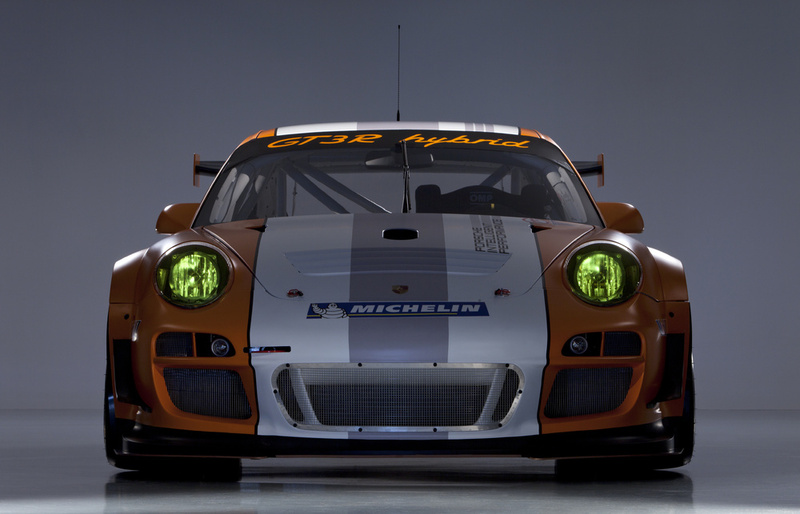 At first glance, the new GT3 R Hybrid is clearly distinguishable from the 2010 model. Thanks to the optimisation of the hybrid system’s high voltage components, the large louvres in front of the rear fenders were no longer necessary. This reduces drag and also lowers fuel consumption. All in all, the weight of the vehicle decreased from 1,350 to 1,300 kilograms. The cockpit of the 911 GT3 R Hybrid has also been completely revised. Most of the displays and controls have moved to the steering wheel. Drivers can operate the rest of the functions via backlit buttons now situated on the centre console. Priority was placed on the ergonomics and the clear layout for pilots – particularly in darkness. The new 911 GT3 R Hybrid is a perfect example of the ‘Porsche Intelligent Performance’ philosophy, a principle found in every Porsche: More power on less fuel, more efficiency and lower CO2 emissions – on the race track and on the road.